I've read a number of science fiction books that feel like a Frankenstein of the genre. A little bit of this, a little bit of that -- but all concepts I've seen before. 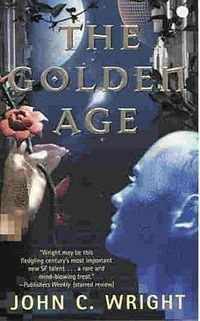 The Golden Age is not that book. My favorite thing about it was the wealth of new ideas, bombarding my brain at high velocity. At first, I was confused; there's a learning curve here. John C. Wright created a far-future world that actually feels like the far-future. Humanity has changed. Much of it is unrecognizable, dwelling in machines or mass-minds or bodies of their own design. Once I had a grasp on events, I was mesmerized. Once I finished, my brain felt like it had been pulled into taffy by black holes on either side of my ears, and I wanted more. Our protagonist is Phaethon, a young man in this new age of immortality. The Solar System is alight with its year-long, millennial celebration, but Phaethon steps away from the festivities when he discovers a two-hundred year gap in his memory. Finding where the memories are stored isn't difficult. The difficulty lies in deciding whether or not to open them. He's told he agreed to lose them, and if he opens the memories, he'll face exile from society -- the most peaceful, prosperous society the Solar System has ever seen. There's ten thousand other things I want to gush about the plot, but they all scream "spoiler!" The story flips itself on its head more than once. In a world where changing one's memory and personality is easy, sometimes what I suspect is real isn't, and what I doubt, is. One of the characters says that the only predictable man is an honest man, and Phaethon fits that description. He's a hero worth cheering for, and his story makes this strange, distant future an accessible one. I'm happy to say that the remaining books in the trilogy, The Phoenix Exultant and The Golden Transcendence, exceeded expectations. The science fiction never gets old and the plot never dulls. What more could I want? Hm, interesting. Not really my thing, but I'm always up for a good story!